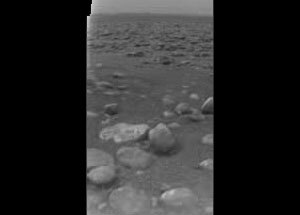 I love that I live in an age when I can be sitting at home on the sofa and looking at a photograph taken on another planet. Okay, so Titan is actually a moon. But it’s still wicked cool. Huygens landed on Titan today, and it was a huge success. Apparently it broadcast for way longer than anyone had expected. CNN’s story reports that scientists were weeping with joy. NASA’s press release was considerably more restrained. NASA’s Cassini-Huygens site has more grooviness. Including, I might add, the sound of Saturn’s rings. (Speaking of the universe being loud.) Eat your heart out, Gustav Holst. Update: 1/21/05: Titan has weather! Cool! The pattern of rainfall on Titan may be seasonal. Ok, so the rain is methane, but still. I looked it up and methane’s melting point is -182.5Â°C (-296.5Â°F) and boiling point is -164Â°C (-263.2Â°F), which means that Titan’s surface temperature is between those. Nippy. But a surprisingly narrow range. Heck, the range in temperature in Chapel Hill has been greater than that during the past 2 weeks.